Groups like Eni, Wilmar, Novamont, Reverdia, Blue Sphere, or the many consortia? The key takeaways; the mandates and national targets; the key producers; process technology R&D; feedstock & supply chain development. All in one concise guide. Key takeaway: Italy is part of the EU and its overall Renewable Energy Directive; strikingly, it is the first country in the EU to decide to create a 0.6% advanced biofuels blending mandate by 2018, the first in Europe to set up such a policy to boost demand for next generation fuels. That figure will increase to 1% by 2022. Beta Renewables can produce 75 million liters per year at its facility in Crescentino and the country expects three more cellulosic ethanol plants to come online in southern Italy during the next year. 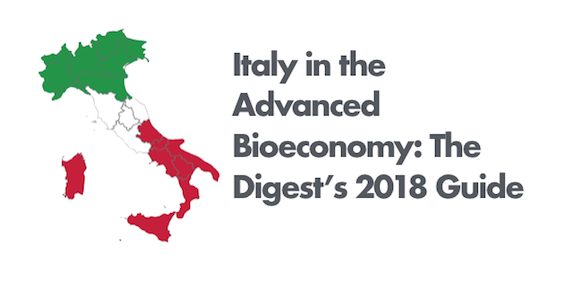 Without a doubt, the biggest news of the year in Italian national policy was the news that emerged in April that Italy is moving forward with a EUR4.7 billion incentive scheme for biogas. As we reported in April, the government began consulting on the implementation of its new biogas policy in late March that will seen biogas producers earn around EUR300 per generation credit of 10 GCal of biogas available for public consumption, while producers of “advanced” biogas using certain feedstocks will receive EUR375 for every 5 GCal, and those co-digesting with advanced feedstocks will receive up to 70% of the “advanced” biogas credit. The policy is meant for implementation in 2018 through 2022 with incentives available for up to 1.1 billion cubic meters of biogas annually, totaling EUR4.7 billion in incentives during the implementation period. Elsewhere, we reported in March that Venice will begin a seven-month trial in April using 15% blending of used cooking oil-based biodiesel in its waterbuses that travel the city’s famous canals. Eni will be supplying it’s Eni Diesel+ fuel in part produced from UCO collected in Venice by local utility Veritas, which is responsible for collecting and processing waste in the city. Much of the city’s air pollution is caused by the waterbuses, as well as cruise ships that visit the region. But we shoudl not overlook the commitment also of the Italian Navy to a green fleet. In March 2014, we reported on the Italian “Flotta Verde” (Green Fleet) project, which started in close conjunction with the earlier US Navy Great Green Fleet initiative that will culminate with an alternative energy demonstration activity at sea in 2016. Fuels interoperability is paramount for successful combined operations of allied country’s naval vessels and aircrafts. ITS Foscari’s sea trial on green F76 demonstrated that it is possible to reduce the Italian Navy’s foreign oil dependency up to 50%. This is a very ambitious target for the Italian Navy Fleet’s consumed energy from alternative sources to be reached in the coming decade and yet it contributes, together with energy savings and increased energy efficiency, to reduce greenhouse gas emissions and comply with international reduction commitments. For an overall spiritual structure, we would look no further on the Italian Peninsula than Pope Francis’ Laudato si’ (Praise Be to You) On the care for our common home, his second encyclical, concerning Catholic doctrine with respect to climate change, consumerism, and development. In calling Catholics and Catholic Church to renewed action on climate change and discussing its roots in and relation to human behavior and moral attitude. In his letter, he takes on climate change, biodiversity, biotechnology, renewable energy, sustainable development — all, flowing from themes of human dignity, “the principle of the common good”, “justic between the generations”, stewardship of the earth, compassion, turning away from what he termed “the sin of indifference” and with a charge for professing Christians to reject financial and economic considerations as the sole criteria for development and use of the earth’s resources. He quoted Pope Benedict XVI’s Homily for the Solemn Inauguration of the Petrine Ministry: “The external deserts in the world are growing, because the internal deserts have become so vast”. Key takeaway: Italy had been a leader in cellulosic ethanol, via Beta Renewables; but has been most notable in new capacity in the past 12 months on the chemcials side, particularly in levulinic acid and PHA. But Italy remains a major player on the biodiesel side, especially with Eni’s long-term interest in renewable diesel and biodiesel. The news of the year is that Bio-On started up its first polyhydroxyalkanoate (PHA) bioplastics plant for markets such as cosmetics microbeads. The €20 million investment—which includes associated research laboratories to expand the range of applications—is designed to produce 1,000 metric tons per year. “From today, thanks to our bioplastic, many companies will have the chance to protect the environment and give ecological credentials to their products, in compliance with ever more stringent limits on the use of conventional plastics,” Bio-on Chairman and CEO Marco Astorri tells Chemical Engineering Online. We reported in July that the unit is undergoing tests and is expected to be fully operational some time in the fall, Riccardo Casoni, Bio-on Plants director, adds. The first product out of the plant will be Minerv Bio Cosmetics bioplastic microbeads to replace petroleum-based microbeads that end up in the ocean and have been subject to recent regulatory bans. Elsewhere in recent capacity, news we reported in November 2016 that Novamont opened the world’s first commercial-scale facility for the bio-based production of bio-based 1,4-butanediol, in Bottrighe (Adria), North East Italy. Having licensed Genomatica’s technology, the Novamont Mater-Biotech plant will produce 30,000 tons of BDO per year from renewable sugars. The capacity is 70% up from the original target of 18,000 tons. The plant’s capacity was expanded due to higher anticipated demand for renewables, continually-improving process performance, and competitive economics. In June 2017 we repoirted that Novamont confirmed that its Bottrighe plant meets performance parameters including overall process performance and production volume to date for bio-based 1,4-butanediol (BDO). The plant is designed to use Genomatica’s licensed process technology to produce BDO from renewable feedstocks. Following startup in late 2016 the plant operations have been notably smooth. Genomatica also confirmed that more than 10,000 tons of Bio-BDO have been produced worldwide using its GENO BDO process. Novamont’s new Bio-BDO plant has added to volumes previously generated during production campaigns in 2012 and 2013. The earlier campaigns generated a few thousand tons and validated commercial scale performance. They helped pave the way for the first dedicated Bio-BDO plant that uses the GENO BDO licensed technology. The news of the year has been the proposed auction of Beta Renewables and its shuttered cellulosi ethanol assets in Crescentino, Italy — the world;’s first commercial-scale cellulosic ethanol plant and at 20 million gallons one of the largest around, too. The parent company tumbled into economic crisis primarily as a result of delays and cost overruns on a PET chemical plant project in Corpus Christi, Texas aimed at making clear plastic bottle resins — a project plagued by difficulties many of which stemmed from Hurricane Harvey slamming into the Texas coast in 2016. The death of managing director Guido Ghisolfi in 2015 also deprived the company of its driving technological force. As we reported in July, Biochemtex S.p.A., Beta Renewables S.p.A., IBP Energia S.r.l. and the Italian Bio Products S.r.l. companies belonging to the industrial group Mossi & Ghisolfi S.p.A., will be auctioned off en bloc in an inseparable sale to the highest bidder. The four bioenergy and biofuel companies will be auctioned off in Italy’s Court of Alessandria starting at a minimum bid of of € 75.0 million, in addition to the assumption of charges for a leasing contract related to the power plant for a maximum amount of € 18.6 million; assumption of the T.F.R. and related charges related to all employees in force, for a total amount to date of approximately € 963,000.00; and a “variable” component for up to a maximum of € 20 million on the basis of revenues in the next five-year period. In new capacity, in March 2015 we reported that Eni announced it will convert the Gela refinery in Sicily into its second hydro-treated vegetable oil (HVO) renewable diesel unit. Eni’s capacity to process vegetable oils once the Gela refinery begins operations this tyear will be approximately one million tonnes per year. This will give Eni the ability to acquire [all] products from CONOE oil-purchasing companies on the national market, which amounted to over 65,000 tons in 2016. Eni’s CEO told the Senate’s industrial committee that the company plans to restructure itself away from oil refining—an industry that has suffered losses of EUR6 billion since 2009—and instead focus on biodiesel and other alternative fuels. In this way it can avoid laying off staff, keep its manufacturing facilities operating, but refine biodiesel instead of fossil diesel. In M&A activity, we reported that Blue Sphere Corp acquired 4 fully operational biogas facilities in Italy. Each of these facilities produce 1MW. Blue Sphere Corp. established Blue Sphere Italy S.r.l as a wholly-owned subsidiary for all future Italian acquisitions. The Company anticipates the potential of 13 more acquisitions in the near future. Blue Sphere Italy S.r.l signed a definitive agreement with Kinexia, an Italian public company, and will now await a change of control process that could take up to 60 days from the date of execution of the definitive agreement. In September, the European Commission’s merger regulator approved the creation of a joint venture between Wilmar International and Fox Petrolifera Italiana SpA of Italy to be based in the Netherlands in order to operate Fox’s existing biodiesel plant in Italy. The EC determined under its simplified merger procedure that the move would pose no threat to the common market as the JV’s market position would remain limited and under threat by major multinationals in the biodiesel space. Key takeaway: In making new technology work, the focus ultimately falls not on the process engineers, the feedstock procurere, the developers of mandates or the financiers. It falls on the application developers, and Reverdia has been hard at work for several years establishing partnerships towards that end for its bio-succinium. But now, a slew of applications are being developed or embraced in Italy. Let’s start with Bio-On, which just opened its commercial PHA biorefinery. In May we reported that Bio-on and ITALERI confirmed their alliance for the toys of the future with new Minerv Supertoys, a eco-sustainable, child- and environmentally friendly, natural and 100% biodegradable biopolymer based line of toys. The product now goes to the market and the toys supply chain following completion of the test phase. The goal is to enact an investment plan that will develop and demonstrate PHAs bioplastic toys made exclusively from renewable organic resources not intended for human food and 100% biodegradable in water and soil. Also in May we reported that Bio-on launched a brand-new line of cosmetic ingredients for sun protection made from biodegradable bioplastic. The Minerv Bio cosmetics brand gains a new line of eco-friendly SPF (Sun Protection Factor) Booster products called minervPHB RIVIERA which are made with micro powders made with Bio-on’s bioplastic, obtained from renewable plant sources and 100% biodegradable. These ultra-green ingredients (micro powders made from biodegradable bioplastic microscopic spheres or capsules) are designed to significantly reduce the percentage of UV filters used in the sun protection product and boost water resistance. The minerv bio cosmetics portfolio is now extended to include minervPHB RIVIERA an SPF Booster suitable for all solar formulations and minervPHB RIVIERA PLUS an innovative SPF Booster, enriched with antioxidants, ideal for total care products (skin care, make-up, hair care). And last December we reported that Kartell took a 2% stake in Bio-on with a 10 million Euro investment. The challenge facing both Bio-on and Kartell today is to accelerate the development of organic electronics based on Bio-on’s technologies in order to gain a leadership position in this new sector. Research in this field of application is already being conducted at Bio-on laboratories and the first results are expected in 2018. In July we reported that Capsula Mundi has introduced organic burial pods for those who wish to have a green funeral. The deceased is placed in the biodegradable sack in the fetal position. The capsule is then planted in soil with a seed or tree. “My grandma is an oak tree. She chose to do this because she preferred a tree to a tombstone. And when I visit the wood, I feel grandma is still with me,” Tweets one family member. Capsula Mundi says the practice could one day replace graveyards full of headstones with woodlands for people to visit and remember their loved ones. Also in July we reported that researchers at the University of Trento fed spiders graphene. The result was spider silk three times stronger and ten times tougher than wild silk spiders. Meanwhile, we reported in May that abandoned fishing nets and old carpets are just a few examples of the waste that are used to produce ECONYL yarn, a regenerated nylon fiber, used by carpet manufacturers who make sustainability one of the pillars of their business. Radici Carpet chose ECONYL yarn for their sophisticated luxury rugs and for their special carpets printed using Chromoproject technology. ECONYL yarn is solution dyed and space dyed PA6 from regenerated pre- and post- consumer waste for the contract and high-end residential sectors. The SuperDesignShow demonstrated carpets with attractive designs that re-launch the technology of printing toward a new era, without limits of color and imagination. Radici Carpet’s made with ECONYL yarn perfectly reproduce the look and feel of warmth given by natural fibers, but are made from complete regenerated fibers. And in December 2017 we reported that designer shoe brand VEERAH has launched a line of footwear made from apple peels. The vegan leather, which took six years to develop, is made from organic apples handpicked in the Italian Alps. VEERAH told Plant-Based News it is the first brand to use apple peels to produce shoes. Meanwhile, Reverdia has been developing applications partners, too. In May 2016 we reported that Reverdia and Wageningen UR Food & Biobased Research launched a joint development programme on bio-based PBS (polybutylene succinate) compounds for injection moulding. The new bio-PBS compounds will be durable and based on Reverdia’s Biosuccinium. In November 2016 we reported that Reverdia announced a strategic partnership with Hangzhou Xinfu Science & Technology Co., Ltd. (Xinfu). The partnership represents a collaboration to adopt Biosuccinium in bio-based polymers and co-polymers for the packaging industry, as well as a long-term supply agreement. Xinfu is a global pioneer in fully biodegradable resins and films. It will exclusively use Biosuccinium® for producing bio-based polymers, derivatives and new cutting-edge biomaterials for packaging applications such as (compostable) single-use bags. In October 2016 we reported that Reverdia and Dezhou Xinhuarun Technology (Xinhuarun) agreed to jointly develop and promote Biosuccinium-based microcellular polyurethane (PU) foams. These new microcellular foams will be used in soles for footwear and further applications. Based in China, Xinhuarun’s products are exported across Asia, America, Europe and the Middle East. Produced since 2012, Biosuccinium is sold globally. The Biosuccinium Technology is also offered under license to value chain partners and co-producers. It’s not all been about Reverdia and succinic acid in recent years. In January 2016 we reported that efforts of Eni’s research activities have led to Eni Diesel +, the new fuel with a 15% renewable component, produced from plant oils in Eni’s Venice refinery using the Ecofining technology. Eni is the first company in the world to transform an oil refining plant (the Eni plant in Venice) into a biorefinery. Using the Ecofining technology it owns (developed in 2006 in the San Donato Milanese laboratories, in cooperation with Honeywell UOP), Eni transforms plant oils into a complete hydrocarbon product that overcomes the qualitative problems of traditional biodiesel. Eni Diesel + became available in over 3,500 fuel stations all over Italy, for customers who want to combine the performance features of the latest-generation premium fuels with more care for the environment. Key takeaway: In new technology, the focus this year has been on PHA and bioplastics. In June 2015, we reported that Bio-on was ready to grant licenses for its PHAs bioplastic technology using biodiesel by-products. Bio-on technology now enables production facilities producing from 2,000 tons/year to 10,000 tons/year of PHAs to be realised. PHAs, or polyhydroxyalkanoates, are bioplastics that can replace a number of traditional plastics currently made with petrochemical processes using hydrocarbons. PHAs guarantee the same thermo-mechanical properties with the advantage of being completely naturally biodegradable. Genomatica also partnered with Versalis on advancing the production of bio-butadiene specifically for Versalis’ use of it to make bio-rubber or more specficially bio-polybutadiene (bio-BR), as reported in the Digest February 2016. This was a huge milestone for the rubber industry with the use of sugars as feedstock rather than the usual hydrocarbon feedstocks. The project started with the establishment of a technology joint venture between Versalis and Genomatica in early 2013 which developed a complete process to make bio-BDE and license the resulting technology. Key takeaway: Think waste oils aggregation. In December 2017 we reported that in an attempt to boost used cooking oil supplies for its Venice HVO refinery, Eni has teamed with Utilitalia, the national association of publically-owned utilities, and CONOE, the national association of UCO and fats collectors, to collect UCO from the homes of its employees around the country. The former oil refinery that was converted to produce HVO produces green diesel, green naphtha, LPG and potentially also jet fuel using Eni and UOP-Honeywell’s EcofiningT technology. In May 2017 we reported that Eni and CONOE, The National Consortium for the Collection and Treatment of Used Oils and Fats, have signed a Memorandum of Understanding to promote and increase the collection of vegetable oils that will supply Eni’s Venice biorefinery and, from 2018, Gela. CONOE will invite all Consortium regeneration companies to supply Eni with used oil which Eni will in turn use as feedstock for its biorefinery in Venice. The Venice plant is the first refinery in the world to be converted into a biorefinery, and has the capacity to transform organic raw materials into high quality biofuels. Since May 2014, the plant has produced green diesel, green naphtha and LPG and has the capacity to create jet fuel. It is currently predominantly fed by palm oil, supplied exclusively from certified sources in line with industry standards. This will be partially replaced by used vegetable oils and, soon, by oils from animal fats and so-called advanced raw materials such as algae and waste, which avoids competition with the agri-food market. But there’s also the consortia. Italian insitutions are found in many of the most interesting EU-based groups targeting feedstocks such as wood chips and algae, as well as in the COSMOS oilseed consortium. RE-CORD is especially heavy on Italian membership. In March 2015, the University of Bologna became one of 18 partners in the EU funded research project COSMOS. Led by Wageningen UR Food & Biobased Research, this 4.5-year project aims at reducing the dependence of Europe’s oleochemical industry on imported plant oils by turning camelina and crambe into profitable, sustainable, multipurpose, non-GMO European oil crops. The project comprises eighteen partners, of which 50% are SMEs and large enterprises and the remaining 50% are universities and research institutes. The research consortium is being managed by Wageningen UR Food & Biobased Research. Institutes and universities include Alma Mater Studiorum – Università di Bologna (Italy), Ernst-Moritz-Arndt-Universität Greifswald (Germany), Uniwersytet Warminsko–Mazurski w Olsztynie (Poland), Wageningen University and Stichting Dienst Landbouwkundig Onderzoek (The Netherlands), Université de Rennes (France), Centre for Physical Sciences and Technology (Lithuania), Centre for Renewable Energy Sources and Saving (Greece) and Imperial College of Science, Technology and Medicine (UK). Companies include Enzymicals AG, Institut für Energie- und Umweltforschung Heidelberg GmbH and nova-Institut für Politische und Ökologische Innovation GmbH from Germany, InCatT B.V. (a spin-off company of the University of Amsterdam), Kreca Ento-Feed B.V. and Linnaeus Plant Sciences B.V. from the Netherlands, Solutex GC, S.L. from Spain, Apeiron Synthesis from Poland and Arkema from France. The no-profit research institute RE-CORD manages and runs in its Experimental Area various small/medium size Pilot Plants in the bioeconomy/bioenergy area: an innovative open-top twin-fire gasifier, an experimental reactor for the production of pyrolysis oil, a slow pyrolysis unit for Biochar production, several micro gas turbine systems running with raw bioliquids (VO, ethanol, Pyrolsyis oils), an externally-fired lignocellulosic biomass GT CHP system, and several others. RE-CORD also operates a chemical lab fully deciated to biomass, bioenergy and bioproducts. Members of the RE-CORD Consortium are: University of Florence (Interdepartmental Research Center for Alternative Energy and Renewable – CREAR, and Azienda Agricola Montepaldi Srl, the University farm), Spike Renewables Ltd, Bioentech Ltd, ETA-Florence Ltd, and the no-profit body GAL start Ltd, in charge of local rural development. The Consortium also manages and takes part to several projects in the Bioenergy field such as BIO4A, BECOOL, Heat to Fuels and formerly ITAKA and BABEL. BIO4A (http://www.bio4a.eu/), coordinated by RE-CORD, is the EU H2020 project which aims at bringing HEFA into full industrial scale, by producing up to 5 kt of SAF in a HVO refinery operated by TOTAL based on the process licensed by Axens, and handling the product in a non-segregated mode by SkyNRG. R&D will focus on deploying Camelina in arid areas of EU MED recoverefd by means of biochar and compost addition. Other partners are EC JRC, Camelina Company, CENER, and ETA Florence. BECOOL (https://www.becoolproject.eu/), the EU-Brazil H2020 project coordinated by the University of Bologna, addresses the Advanced Biofuel value chains. RE-CORD is member of the large partnership, dealing with pyrolysis and value chain assessment. Heat-To-Fuel, a H2020 project coordinated by Guessing Energy Technology, adeals with the integration of Gasification-FT processes with Acqueous Phase Reforming and Hydrothermal Liquefaction. RE-CORD is member of the Consortium, and studies the HTL process (designing and operating a 1 kg/h HTL reactor) on lignin and biomass. ITAKA (Initiative Towards sustAinable Kerosene for Aviation), coordinated by SENASA (ES), looked at removing the barriers to the use of sustainable biofuels from Camelina in aviation. ITAKA is an EU initiative under Seventh Framework Programme aiming to contribute to the European Commission’s ‘Biofuel Flight Path Initiative’ annual production target of two million tonnes of biofuel for aviation by 2020. The BABEL project (Advanced Biofuels through Briquetting/Torrefaction to generate Energy from Wood)’s main onjective is to study chains and technologies to increase the biomass primary production added value in the GAL Start Mugello territory, with a particular focus to forestry wood chips and residues from agro-forestry and timber industry.